Saturday, LOUA members spent the day at the Clintonville Festiville. What a great time we had! I couldn’t get over the number of people who stopped by our booth to say “hi .” And so many of those that stopped by had already heard about our Arboretum and just wanted to hear more. I nearly lost my voice talking to people about LOUA we had that many ask for additional information. I guess I sometimes forget that there are more people out there that know about LOUA than the 91 that like us on Facebook! The artists at the Festiville were really great. I bought some earrings and a teabag holder. I could have spent a lot more than I did! If you didn’t make it out this year, you really need to come next year. I kept thinking how great all of the many items would be for presents. We also had our September LOUA meeting last week. This meeting was mostly about plans for the future, and what direction we want to go. One of the things we are working on is planting more canopy trees in tree lawns this October, once again with help from OSU students. LOUA is also working on getting about 1000 understory trees (think dogwoods, redbuds, pawpaws and the like) planted within the Arboretum. Now granted, we are heading into fall and winter, but once these trees are planted over the next several years, the Arboretum will be so lovely in the spring!! I can’t wait to be able to walk through all of those blooming trees. Ohio State around 5th Avenue. 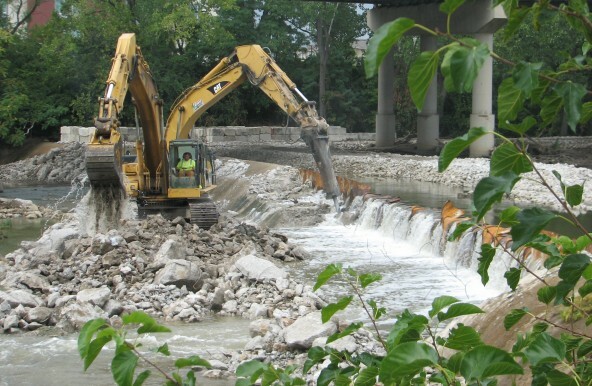 Removing the dam has narrowed the river’s channel and will increase the diversity of fish and invertebrates. The river will be more shallow and meander as it did before the dam was built in the 1930s. I had forgot that the dam was being removed, and it was only when I noticed the level of the river being so much lower that I recalled the dam was gone. OSU is also working on making the campus along the river more attractive and pedestrian-friendly. I can’t wait to see what they do, and with the cooler weather, I might walk down to the river during my lunch.